I’m really excited to share this recipe because this is also my very first Recipe ReDux post! Check out the link-up at the end of this and all of my future Redux posts (the 22nd of each month) for more recipes created by healthy food bloggers. This month’s Recipe Redux theme is ‘spring cleaning’ – or using an ingredient that’s been hiding out in your pantry for a little too long. For me, it was whole flax seeds. Flax seeds are a great source of heart-healthy omega 3’s – just a tablespoon meets your daily needs. Flax seeds do need to be ground up before us humans can absorb the omegas and I think this added step is what led to my poor flax seeds being shoved further and further back in the pantry. I knew the flax was the perfect pantry ingredient to use in a smoothie recipe. Even better, a smoothie that can be eaten with a spoon. It’s like a healthy ice cream sundae that can totally be had for breakfast and/or dessert. Plus, toppings. So many potential add-ins. Try nuts, seeds, dried fruit, fresh fruit, coconut, and/or cacao nibs. A colorful and refreshing smoothie bowl that's wholesome enough for breakfast and delicious enough for dessert. 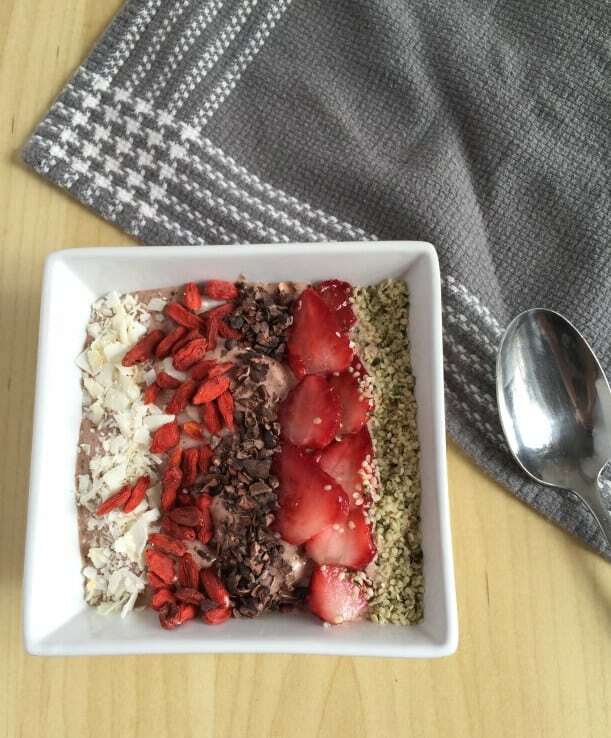 Add banana, frozen strawberries, almond milk, ground flax, and cacao nibs to blender and pulse until creamy. I love a good smoothie bowl! And it’s actually nice enough (almost) to start making them again – yay! This is literally all of my favorite things combined into one mega smoothie. I cannot wait to try it! !